What Tropical smoothie ingredients do you enjoy the most? Smoothies can be super fun, but there are some key principles to blend together in order to give your body the best possible nutrition. Ready to get started? 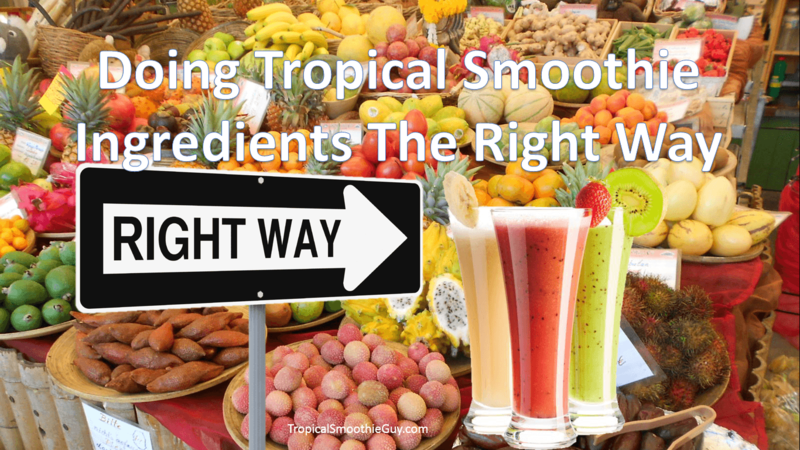 What does chemicals have to do with tropical smoothies? Everything since our Healthcare is largely run by the Pharmaceutical Industry. It’s time to let our food be our medicine through high quality tropical smoothie ingredients instead of synthetic chemicals that are added to our food that cause side effects and long term complications. A lot of tropical smoothies come with added sugar in the form of turbinado. Although this is “more natural” the key thing to keep in mind is that any excess calories not used by your body is stored as fat. That means it tastes good on the way down, but could potentially be staying with you in more ways than one. Moreover, any added sugar is missing the key ingredient of fiber. Fiber slows the impact of sugar to your blood stream and allows for more consistent energy levels (vs. the up then down roller coaster feeling). Turbinado is also not a whole food. Whole foods come with more features than a brand new car! Some of these include vitamins, minerals, protein, healthy fats, and fiber. Vroom Vroom for your health! Processed sugar is an issue because it jacks up your blood sugar which brings you high, then leaves you low in energy later (love ’em then leave ’em mentality, corny, I know). Moreover, high fructose corn syrup isn’t natural so any ounce of it used in canned or bagged fruit isn’t properly recognized by your body and can increase your LDL (“bad”) cholesterol levels and contributes to the negative trend of obesity and diabetes. High fructose corn syrup is also loaded with calories which packs on pounds and is in a ton of the foods we see around us. This is why going organic is the best option for your health. Toxic chemicals and ingredients could be used in your tropical smoothies without you even knowing about it. Some say, “ignorance is bliss” or “as long as it doesn’t kill me, it makes me stronger,” but this couldn’t be further from the truth. Artificial sweeteners, colorings and dyes, and preservatives have been linked to adverse health effects according to www.FoodMatters.TV. Organic food is not only higher in nutrients than non-organic foods, but it doesn’t have all the pesticides, herbicides, or artificial stuff either. It ain’t no fun unless the greens get some, right? A lot of tropical smoothies are packed full of fruits which is good for taste, but they lack one main ingredient…Fiber! Fiber helps to slow the impact of all those sugars to your blood stream for more stable energy levels, it helps to push bulk waste out of your body more effectively so you’re not as constipated, and fiber helps to eliminate harmful toxins from your body. Talk about a Triple Non-Threat! Some of my favorite fruits to use are: Mangos, Pineapples, Bananas, Apples, Strawberries, Blueberries, Raspberries, Blackberries, Watermelon, and Cantaloupe. The tropical “green” smoothie is a high impact habit to increase consumption of fruits and greens. Adding greens enhance the nutritional benefit dramatically. Greens are the most nutrient dense foods on the planet and give your digestive tract a high five! Choosing the right ingredients is vitally important. This is especially true since our dependence on medications as a society for a lot of preventable health related diseases have increased dramatically over the years. Moreover, the stuff made in labs are genetically altered and have a long list of ingredients that I have trouble saying out loud. Smoothie ingredients on the other hand should be naturally simple and easy to pronounce (because they are just fruits and veggies). Letting our food be our medicine isn’t a new idea (ask Hippocrates), but it’s one that has taken a different spin when it comes to Tropical Smoothies. This is especially true since many of the tropical smoothies you get at health spas, gyms, grocery stores, restaurants, or fast food locations are packed full of sugar, non organic ingredients, or missing the nutrient dense greens that make it worthwhile for your body in the long term.